Phnom Penh (FN), Feb. 23 – Cambodian Prime Minister Hun Sen sent a condolence letter to H.E. 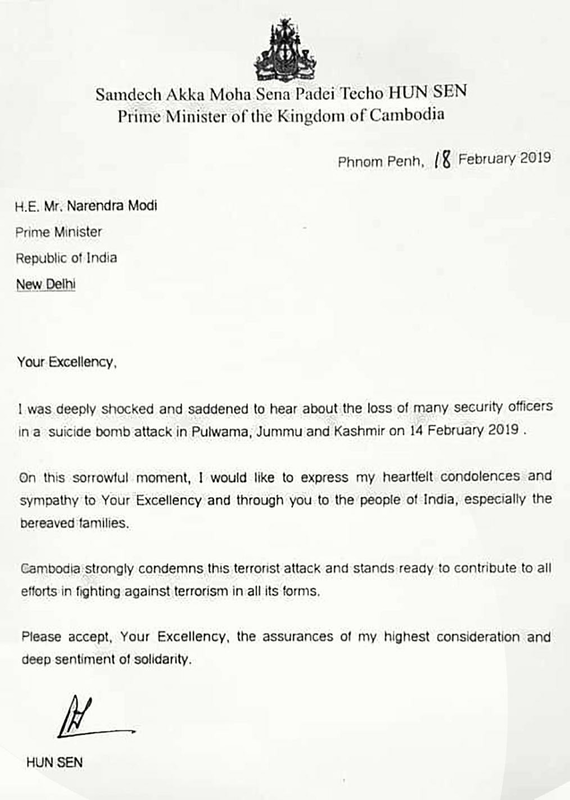 Mr. Narendra Modi, Prime Minister of the Republic of India, on the loss of many security officers in a suicide bomb attack in Pulwama, Jummu and Kashmir on 14 February 2019, according to the Premier Hun Sen’s letter dated 18 February. bereaved families,” Prime Minister wrote. efforts in fighting against terrorism in all its forms,” the letter added. The Pulwama terror attack occurred on February 14, 2019 when a 78-vehicle convoy was escorting over 2,500 Central Reserve Police Force (CRPF) jawans from Jammu to Srinagar. At around 3:30 pm, a Mahindra Scorpio SUV, packed with 350 kilograms of explosives rammed into one of the buses belonging to the convoy on the National Highway 44 at Lethipora near Avantipora town, according to India Today. At least 40 (CRPF) paramilitary troopers were killed in the deadliest terror attack witnessed in three decades of Kashmir's insurgency.